Card Size: 1 5/8" x 3 1/8"
Notes: Unnumbered. These cards were issued by many different issuers in Australia, probably mostly mom and pop stores, and can be found with many different back advertisements as a result. Collector Steve Flemming reports that back advertising has been identified for over 400 different stores so far and it is very likely there are others. Steve has been fortunate to locate some cards from his grandfather's business, spelled Fleming on the cards though the name of the store was really Flemming. Since so many small businesses were involved in giving out these cards, the list of issuers will be difficult to ever fully identify. The cards contained a tab at the bottom that was meant to be cut off the card and returned for some sort of prize. For the card shown when you click the picture link above, the prize was a box of chocolates when 50 coupons were turned in. Because of these prize offers, cards can now be found with or without the bottom tab, usually without. Australian collectors have given these cards a generic name of Victorian Premium Suburban, to indicate the part of Australia where they were issued, that they contained a premium offer, and that they were issued in the suburbs of Australia. 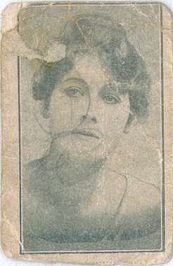 A similar set was also issued which contained the movie star's name in script across the front of the picture area.